New York City officials on Thursday announced a $3.3 million settlement with the family of Kalief Browder, who died by suicide after spending nearly three years in Rikers Island, most of it in solitary confinement. 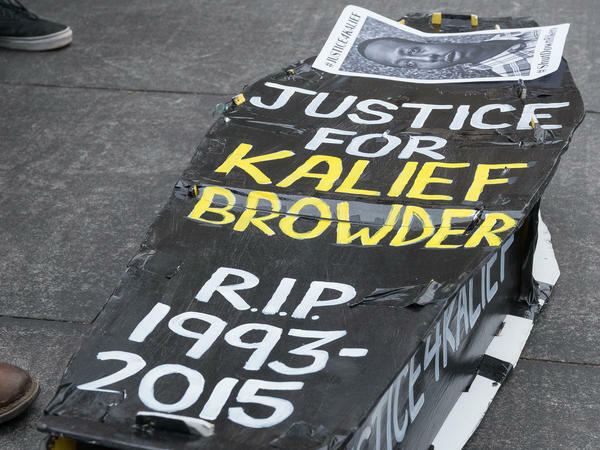 On Thursday, New York City's Law Department announced it had reached a $3.3 million settlement with Kalief Browder's family. The young man from the Bronx, who spent three years detained on Rikers Island without being tried or convicted, was accused of stealing a backpack. Nearly two of Browder's three years in jail were spent in solitary confinement. He was released in 2013 after the charges were dropped. And in 2015, plagued by what he said was the mental anguish and trauma from his time in jail, he hanged himself in his mother's home. "Kalief Browder's story helped inspire numerous reforms to the justice system to prevent this tragedy from ever happening again, including an end to punitive segregation for young people on Rikers Island," Nicholas Paolucci, a spokesman for the city law department told NPR in an emailed statement. "We hope that this settlement and our continuing reforms help bring some measure of closure to the Browder family," he added. According to The New York Times, "the civil rights and wrongful death action is before a judge in State Supreme Court in the Bronx." Browder's family was satisfied with the settlement, Scott Rynecki, one of the family's attorneys, told NPR. "The family is pleased that they can bring closure to this part of the matter but hopes that the national recognition that the case gave to the need of prison reform and dealing with younger individuals continues," Rynecki said. Browder adamantly maintained his innocence throughout his incarceration, which he served because his family couldn't afford to pay his $3,000 bail. Over the years, he rejected numerous guilty plea deals that would have allowed him to escape what he said were savage conditions at the prison. He described instances of violent beatings and torment at the hands of other inmates and guards. He said he was starved and kept in filthy surroundings. And he spoke of intolerable mental anguish suffered at the hands of prosecutors who repeatedly delayed his trial in the Bronx's infamously overburdened court system. Even after being out in the free world for some time, cleared of any wrongdoing and suddenly thrust into the spotlight as a symbol of New York City's pernicious and crippled criminal justice system, Kalief Browder feared he'd been changed forever. That he had been damaged at the core of his innermost self after nearly three years of being caged, mostly in solitary confinement, as an adolescent on Rikers Island after he was arrested. "People tell me because I have this case against the city I'm all right. But I'm not all right," Browder told The New Yorker in 2014. The case against the young African-American man, who was jailed in 2010 at 16, was eventually dismissed without ever being tried. After 31 court appearances before eight different judges, the charges against Browder were dropped. His accuser had left the country and the prosecution could not move forward with the case. Meanwhile, Browder had gone from teenager to adult, missing his high school graduation and enduring a brutal existence within the prison's confines, at least half of which was spent alone in a 12- by 7-foot cell. When he spoke to the magazine he had filed a lawsuit against the city, the New York Police Department, the Bronx District Attorney and the Department of Corrections. Still, he worried that no amount of money would make him whole again. "I'm messed up. I know that I might see some money from this case, but that's not going to help me mentally. I'm mentally scarred right now. That's how I feel. Because there are certain things that changed about me and they might not go back," Browder said. In the end it proved too much. In 2015, he took his own life. He was 22. The New Yorker story catapulted Browder to the fore of a national debate about the criminal justice system, especially as it applies to minors. Two months after the story ran, New York City Mayor Bill de Blasio put an end to the city's use of solitary confinement for 16- to 17-year-olds. Upon learning of Browder's death, de Blasio said, "Kalief's story helped inspire our efforts on Rikers Island, where we are working to ensure no New Yorkers spend years in jail waiting for their day in court." Later, when plans to permanently shutter the prison were set in motion, de Blasio pointed to Browder's suicide as a "wake-up call" to the city, adding that "his death shook the whole city and opened everyone's eyes and made people think twice." The city plans to permanently close Rikers Island and has proposed establishing smaller, neighborhood-based facilities. In 2016, former President Barack Obama similarly noted Browder's experience when he enacted a ban on solitary confinement for juveniles detained in federal prisons. Browder struggled to find his place outside of Rikers Island after he was released, "Before I went to jail, I didn't know about a lot of stuff, and now that I'm aware, I'm paranoid," he told The New Yorker. It was a feeling he couldn't shake, even as he was championed as the catalyst for much-needed change. "I feel like I was robbed of my happiness," he said.